I took this photo in a newstand at Sea-Tac on my way back to NY last week. I wonder what would have happened if I had purchased all of these titles and was reading them while waiting to board the plane? 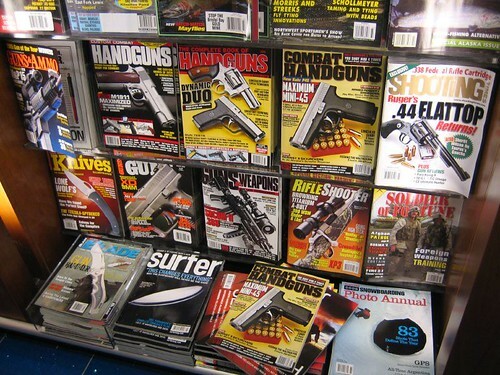 Doesn’t it seem kind of strange, maybe even disturbing, that guns like the one on the cover of “Guns and Weapons”, first, even exist; second are on the cover of a magazine; third, a magazine exists to carry such a picture; and forth, that magazine is sold in an airport newstand?